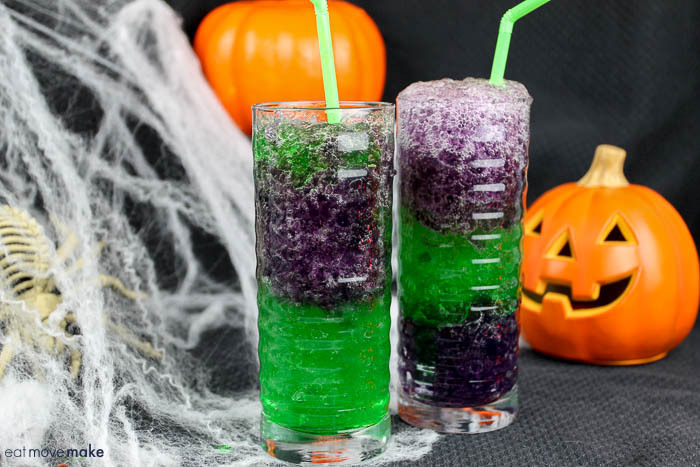 Try this slimy slurpie for Halloween and watch your guests scream in frightful delight. 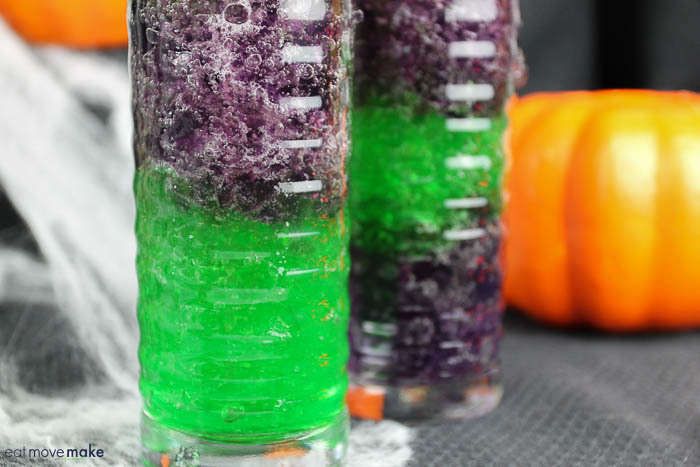 With fizzing bubbles and gelatinous goo, this eerie October potion is meant to scare you. 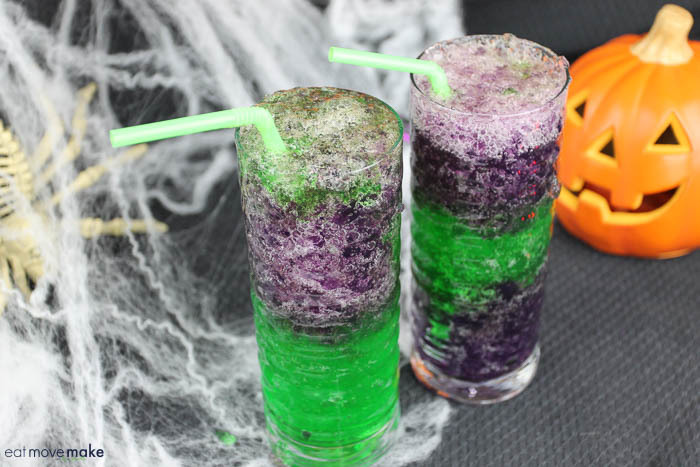 You’re sure to add some festive fun to any Halloween party when you offer a slimy slurpie to your guests. The bewitching colors and gushing bubbles will bring smiles to all ages. I’ve also included directions on how to make a “spirited” version for the over 21 crowd. Prepare JELL-O as directed on package. Refrigerate JELL-O 4 hours or until firm. Using a fork, scrape across the Jell-O breaking it into bits. In each of 4 glasses, alternate colored layers of Jell-O leaving about 1/2-inch to 1-inch space on top. Pour soda over Jell-O layers to rim of glass. Add a straw, and serve immediately. To make with spirits for adults only: When adding cold water to Jell-O, use 1/2 cup water and 1/2 cup vodka instead of 1 cup cold water. Refrigerate until firm and follow remaining directions as written. Hey, Liz! Just wanted to let you know that we loved your Slimy Slurpie so much when you shared it at the #HomeMattersParty last week, we’ve FEATURED it THIS WEEK! Hope you can check it out when you get a sec. Happy Friday!!! 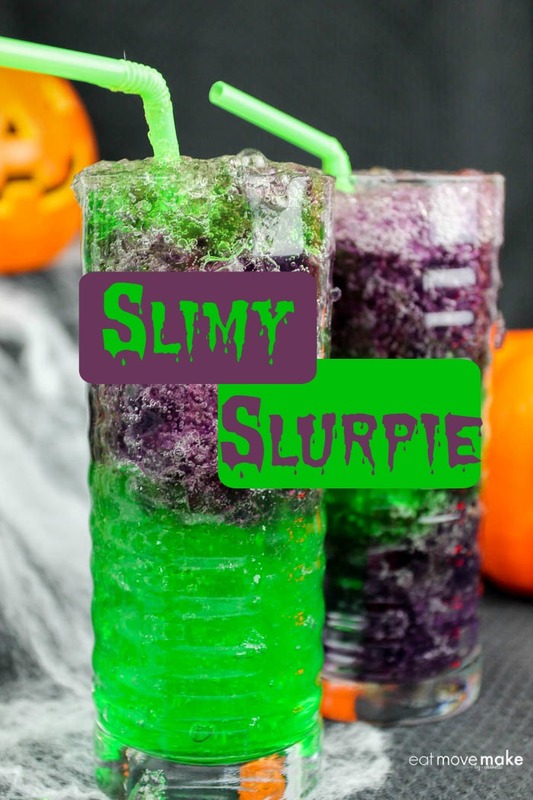 This Halloween slimy slurpy is sure to be a hit at any party! I know my kids would love for me to make it. I’ll have to give this recipe a try. Thanks for linking up with us at the #HomeMattersParty this week. This is such a fun recipe! My nephew would love this! Thank you for sharing at #merrymonday . 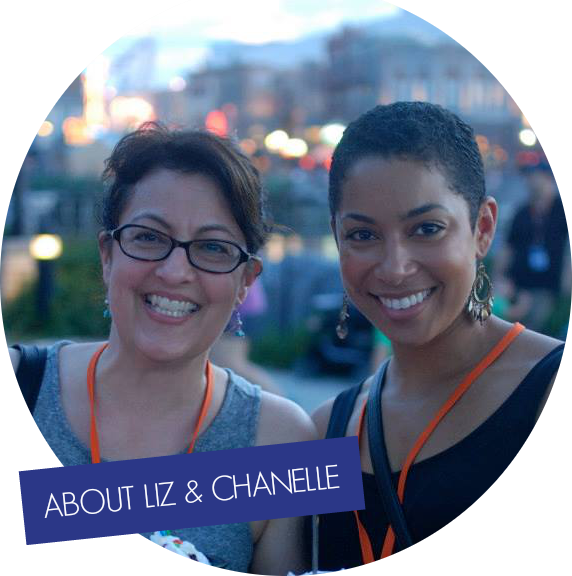 We hope you will link up with us again! Oh boy, the grandkids would really love this. I’ll have to gather the ingredients and try to make this for them sometime soon. I was inspired by the party I will have at the school where I work, I will do for my students, I am sure it will be very successful among them. At first sight I made me say, it’s creepy then while continuously reading, a drink for a Halloween! Haha Effective indeed. Will save this and print so we can make something like this over the Halloween. Those do look creepy but good and perfect for Halloween. My kids would love this. Thank you for sharing. My kids would love this and I can’t believe Hallowyis next month. This kind of slurpie looks so interesting for the kids. They will definitely love this kind of drinks. That looks like something my kids would like to try. It looks super easy to prepare too. I thought it was an actual slime, since that’s so big with the kids these days! This is actually pretty cool! I love the colors and the creativity. It’s going to be a hit this Halloween. This is absolutely darling! My kids flip for ideas like this! They love Halloween so much and they can’t wait to start decorating! So making this for our Halloween party. I know the kids will love this. We have a spooky punch that we make that uses dry ice. The kids LOVE it as this is the only time of the year that we make it. What a great Halloween recipe! I always make fun food for Halloween. I may have to make this slurpy as part of our meal that day! What a super cute idea for Halloween! Who would have thought of a slimy slurpy? Well guess you did! Brilliant, I am sure the boys will love making this. I love this idea! My grandchildren and my young nephews and nieces would really enjoy drinking a slimy slurpee! Thanks for this cool recipe. We’re making this soon! I can’t stand ginger-ale but I would totally make these with Sprite! They would be perfect for my daughter’s birthday right before Halloween. I love the colors! Perfect drink to serve the kids this Halloween. I like this recipe because it is easy to make, and only a few ingredients needed. Thanks for sharing! This is way cool, I love the way it turned out. I don’t give the kids soda, but I can make an exception this time. What a cute idea! My girls will go crazy for these when I make them this Halloween – perfect for a party too! It looks super cool! I am not sure if I will be brave enough to taste it, but I will surely enjoy making some! This Slimy Slurpie looks so cool! I bet it’s fun to make AND drink. I’d love to try the adult version. Thanks so much for sharing it! What a fun Halloween drink. I love that you offered an adult version. Frighteningly fun! A delicious drink like this would be a wonderful option for any Halloween party and a total crowd pleaser for sure. We love our slurps and these look perfect of course for Halloween. Will have to make these ahead of time so I have it down perfect. 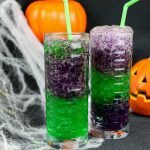 This looks like the perfect Halloween drink! So much fun, and the flavors sound tasty too. This would be great for a party, or a fun drink to have during the month of October. Oh my goodness how amazing does this sound, I totally need to try this ready for Halloween yum! That looks like the perfect drink to serve at a kids’ OR adults’ Halloween party. It’s got that classic look. Very cool. This is the coolest Halloween drink I’ve ever seen! I have to make this for the kids’ party this year. Thanks!